Ronald Roy Gooding was born in 1907, son of Edwin Gooding and Polly Haines. He died in 1967, aged 60 years. Frederick Clifton Gooding was born in 1908, son of Edwin Gooding and Polly Haines. He died in 1959, aged 51 years. Eva Mary Gooding was born in 1910, daughter of Edwin Gooding and Polly Haines. Elizabeth Baird was born on 15 December 1857 in St Kitts, South Australia , daughter of Thomas Baird and Elizabeth O'Brien. Mrs. Elizabeth Haines, 81, wife of Mr. Thomas Haines, of Kapunda, who died recently, was an old resident of the town and district. She was born at Hamilton, and was the second daughter of the late Mr. and Mrs. John Baird. On April 10, 1877, she married Mr. Haines at Christ Church, Kapunda, and last year they celebrated their diamond wedding. After their marriage Mr. Haines farmed at Hamilton for 18 years, and then moved to Mundoora. After a few years they returned to Hamilton, stay ing there for a further ten years. They then worked land at Cowell for nine years, and 17 years ago went to Ka punda to live in retirement. Our Kapunda correspondent Writes: —Mr. Thomas Baird, who resided with his daughter, Mrs. O'Callahan, Clare road, Kapunda, died on Monday, at the advanced age of 90 years. He was born in Fifeshire, Scotland, on March 17, 1820, and arrived at Adelaide in the ship Navarino in 1837. Before he moved away from the future city, Mr. Baird and his twin brother James discovered on the banks of the Torrens the body of the first white man who had been murdered by the blacks. Mr. Baird had the honor of grubbing the first tree where Hindley-street is now laid out. Subsequently he was engaged by Mr. Rankine, at Mount Crawford, who carried on dairying. He had been attracted to the Kapunda district by the discovery of the copper mines, and bought a section of land where the public school now stands. When the Victorian gold diggings broke out, Mr. Baird and his brother took out passengers from Kapunda in his bullock dray. Before he left he sold his land to Mr. Jas. White for £5. After his return he started carting on the Burra road, but soon settled down to grazing and agri culture at St. Kitt's Creek, near Truro, after having given a trial to a section at Moppa Springs. At Truro he lived in the one house 54 years. Mr. Baird belonged to a long-lived family. His twin brother died last year, aged 89; his elder sister, Mrs. Duell, died at Burra, aged 91; and another sister, Mrs. Brock, who has reached 88 years, still lives in Adelaide. He was married three times, and his third wife predeceased him five years. He leaves three sons and four daughters, and also many grandchildren and great-grandchildren, and one child of the fifth generation. Henry Thomas Haines was born on 7 April 1879 in Kapunda, South Australia , son of Thomas Haines and Elizabeth Baird. He died on Sunday, 2 November 1941, aged 62 years, 6 months and 26 days, in South Australia . 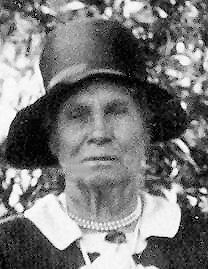 Edith May Haines was born on 15 March 1881 in Kapunda, South Australia , daughter of Thomas Haines and Elizabeth Baird. On 1 July 1903, Edith, aged 22, married William Henry Siviour, aged 27, son of Richard Henry Siviour and Clementine White Rolland, in Methodist Church in Hamilton, South Australia .